How cute is this preppy girls’ room? The colors are so fresh and bright, and the matching bed sets are adorable. This has to be one of my favorites here just because of how much I adore the suitcase end table. 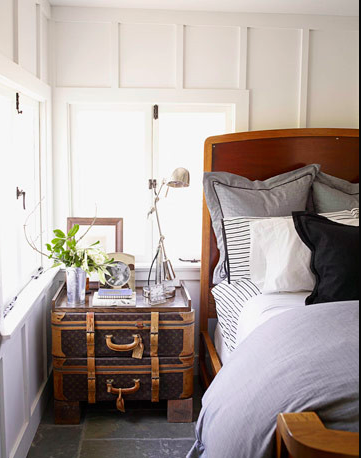 Not only that, but this bedroom does a wonderful job of creating a preppy, masculine feeling. Holy pink! This sitting area is absolutely stunning, and gives the air of sophistication the preppy style is known for. Love! I am in love with this scalloped skirt! Very chic, especially when paired with navy (my favorite!) and accented with gold jewelry. This plaid is positively delicious! 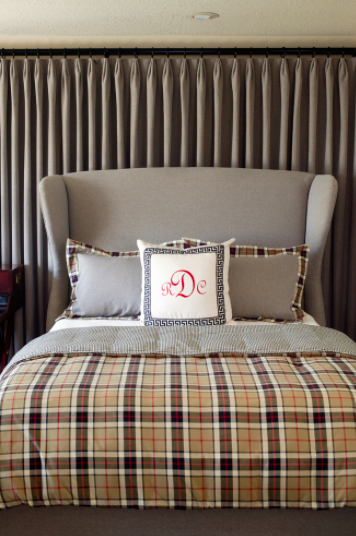 In an otherwise overly grey bedroom, this preppy plaid bedspread and matching throw pillows are wonderfully eye catching. I am all about the use of these stripes on the wall–very creative! The all white furniture was just the right choice for this room. When you have a busy colorful wall such as this, solid colored furniture with pops of matching accents is usually going to be your best bet. Ralph Lauren truly is, and always has been, the pinnacle of preppiness. These rainboots are fantastic! This kelley green and cream sunroom is just… wow. 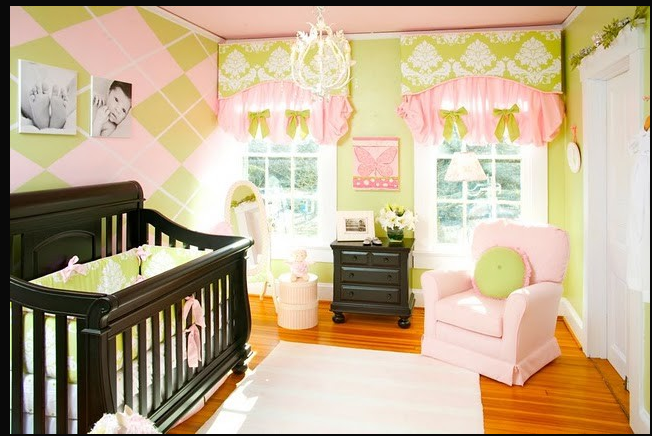 This nursery is amazing, I love the argyle wall, and used with the color scheme this room just glows with preppiness. 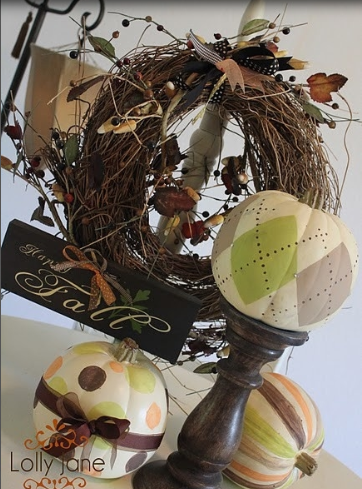 Even Holiday decor can get a preppy boost! Another cute skirt for my list! I just love the chambray shirt, pearls, and pop of coral–very preppy, very pretty! So what you think of the preppy style? Have you used it for inspiration in your design or fashion? I love preppy (a little too much)! My favorite photo is the pink sitting area. Swoon! 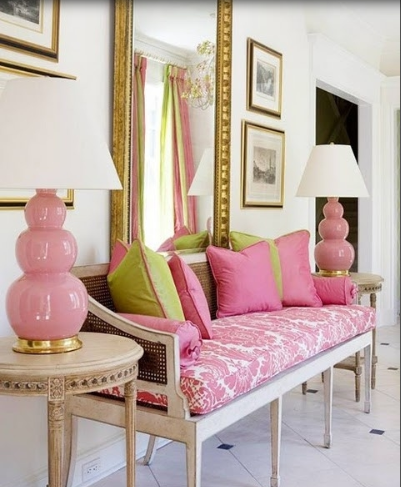 Isn’t that pink sitting area just divine? You have a wonderful blog! A preppy lover’s paradise 🙂 Thanks for reading, RTC! I love the timeless preppy style. I can wear my grandmother’s scarves with my clothes. I can mix old and new, and even though I am close to 40, I can’t get enough pink in my life. You can never have too much pink! 🙂 It’s great that you’re wearing your grandmother’s scarves, I love having sentimentality behind clothing. Thanks for reading! I’m a prepster, that’s for dang sure. I like to think my home is a little preppy too. It’s not JUST preppy that WE love, it’s preppy with a twist! (metallic shoes on Olivia up there, those fab curtains in the pink bedroom) love Love LOVE it! Flaunt that preppy lifestyle, girl! Putting a twist on something as classically great as the preppy style is so much fun, and for a designer doing so is one of the best ways to expand your creative horizons. Thanks for reading! Bedroom with suitcases is definitively my preference. Isn’t it fantastic?? Definitely something I’ve always wanted to do with a nice well-worn (and well-traveled!) suitcase 🙂 Thanks for reading, Valentina! I love objects with history to tell. I am not sure. I am not really great at this, lol. I’m sorry.